Cebu restaurants have evolved over the years from simple food stalls into establishments providing international cuisine and fine dining. The word restaurant originally meant "a cup of soup" - a restorative - which was used to energize and replenish one's strength. Before restaurants as we know them today appeared, traveler's sat at a tavern's table with a group, necessitating quick hands to grab the food as it was served! Today, in Cebu there are several establishments providing quality culinary choices at reasonable prices. In addition, there are the 5 star hotels offering gourmet delights in their equally high quality restaurants. Cebu restaurants offer a variety of cuisines including but by no means limited to FILIPINO, CHINESE, and THAI. Like in most Asian countries, the staple of the Filipino food is rice. Filipino food is more of a combination of sweet, sour, and spicy. 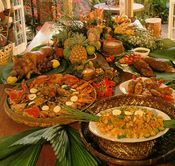 Filipino food actually varies by region, yet the eating habits of the Filipinos is mainly the same throughout the country. An average family eats 5 meals a day, breakfast (agahan), snacks (merienda), lunch (tanghalian), snacks, dinner (hapunan). Breakfast is usually served with fried rice (sinangag), eggs (over-easy or scrambled) and some type of meat. Snacks primarily consists of hot bread (especially 'pan de sal') and softdrinks. And during summer, HALO-HALO (a mixture of sweetened beans and fruits topped with crushed ice and ice cream) is a favorite of everyone. Lunch and dinner may consist of sinigang (soup with mixed vegetables, meat/seafood soured with tamarind), lechon kawali (deep-fried pork) or lechon baboy/manok (roasted pork/chicken) with suka at bawang (vinegar and garlic) as a dipping sauce. Fish in most kind, often inihaw (grilled) is also a common on the table. Cebu restaurants offer some of the best Filipino and grilled dishes. In some cases, though no loger practiced by many, food is eaten with the hand. In normal circumstances, Filipinos use spoon and fork. Rice is a critical part of much of Chinese cuisine, however, in many parts of China, particularly northern China, wheat-based products including noodles and steamed buns predominate. Soup is usually served at the start of a meal and at the end of a meal in Southern China. In most Chinese dishes, food are cut into bite-size pieces (e.g. veggetable, meat...). In a Chinese meal, each person is given his/her own bowl of rice while other accompanying dishes are served in communal plates/bowls that are shared by people sitting at the table. 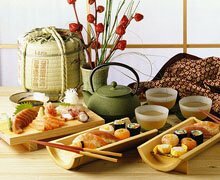 Chopsticks are a primary utensil in Chinese culture for solid foods, while for soups and other liquids they use a wide, flat-bottomed spoon, traditionally made of ceramic. 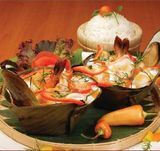 Thai cuisine is a surprising blend of sweet, sour and hot flavors. Small amounts of individual components, essential to Thai cooking, blend to create a subtle yet distintive flavors. Chillies are a common ingredient in Thai cuisine, although not all dishes are hot. Rice is very important in Thai cooking and is included in all meals, except for quick snacks.